The GAA have promised to come down heavily on anyone found guilty of racist abuse following accusations made against supporters at a recent schools game. Pobalscoil Chorca Dhuibhne from Dingle in County Kerry claim that racist chanting came from among the support of Naas CBS during the schools' recent Hogan Cup semi-final, won by the Kildare outfit. Croke Park’s Post Primary committee confirm that they have received correspondence from Pobalscoil Chorca Dhuibhne and a separate complaint from a member of the public who attended the game. "The Association has a very clear policy on this," stressed the GAA’s Post Primary chairperson, Seamus Woods, speaking to RTÉ Sport. "Rule 1.12 of our Official Guide deals with racist behaviour. Anything in conflict with our policy of inclusion and diversity can be deemed a discredit to the Association - there is a very high threshold of response. "Rule 7.2 (e) deals with discrediting the Association and there is a range of penalties ranging from eight weeks suspension for individuals and units right up to expulsion." The Hogan Cup is the blue riband schools football competition for Under-19 boys with the finals broadcast live annually on TG4. Naas, who went on to lose the recent final at Croke Park to St Michael’s Enniskillen, beat Pobalscoil Chorca Dhuibhne in the semi-final. The Kerry’s school’s principal and team manager Eamonn Fitzmaurice says they delayed making a complaint until after the final to avoid any suggestion of ‘sour grapes’. "We had been beaten fair and square by the better team on the day. We just wanted to have our facts straight," said the former Kingdom boss, speaking to the Irish Independent. "It was after the game that I was made aware that there was a racist element to some of the chanting, not all of it. It definitely wasn't anything to do with the opposition players. "It very much came from an element of the supporters, not all of them, it should be pointed out." 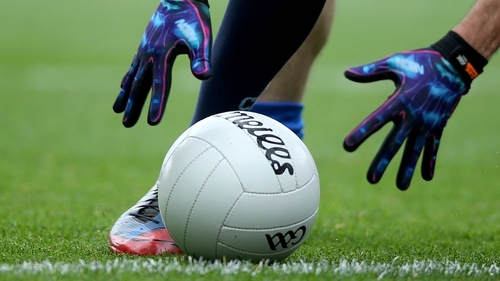 Post Primary GAA will deal with the matter at their next scheduled meeting on Tuesday, 7 May. Woods says they will try to bring this forward in order to deal with the case sooner, though that this may not be possible due to the forthcoming Easter break. "You can rest assured that the All-Ireland body will prioritise and progress this at our next meeting," he said. "We don’t have all of the specifics together yet and, of course, we will require a response from Naas CBS. "I am personally appalled by this. I, Post Primary GAA and the wider GAA family condemn such behaviour unreservedly." Naas CBS manager Ronan Joyce was contacted by the Irish Independent and said that he was unaware of any racist chanting, though that he is totally against such activity.